No false promises here! 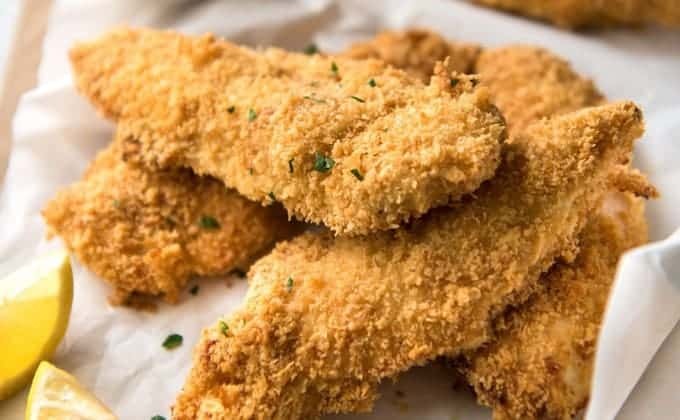 These Oven Fried Chicken Tenders come out of the oven perfectly golden all over and super crunchy just like they’ve been deep fried. You’ll love the irresistible parmesan flavour in the crunchy breadcrumb crust! AND you won’t get your fingers caked with batter and breadcrumbs in the process of making them. Find out my little tricks! b) the crumbing is not that crunchy (unless you bake it so long the chicken overcooks)? Plus my other gripe with coating anything with breadcrumbs is that you end up with what I call “Marshmallow Fingers”, where the egg batter and breadcrumbs builds up with each piece of chicken you coat. So one day, I actually applied some brain power to solving these problems. I know, I’m a weirdo. It’s a testament as to how much I love crunchy crumbed things, and how much I fear frying (as well as what I consider to be a waste of oil). (Oh – and health matters too ?). 1 . 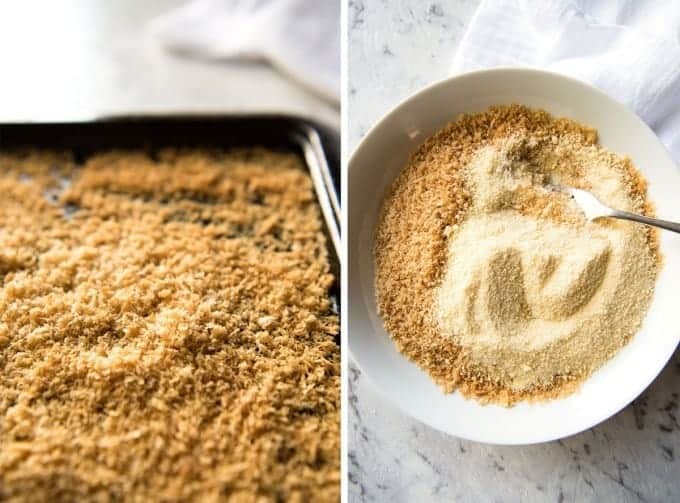 Toast panko breadcrumbs in the oven for just 3 minutes. This gives them a head start on the colour so they come out an even golden brown all over AND dries them out even more to make them uber crunchy. 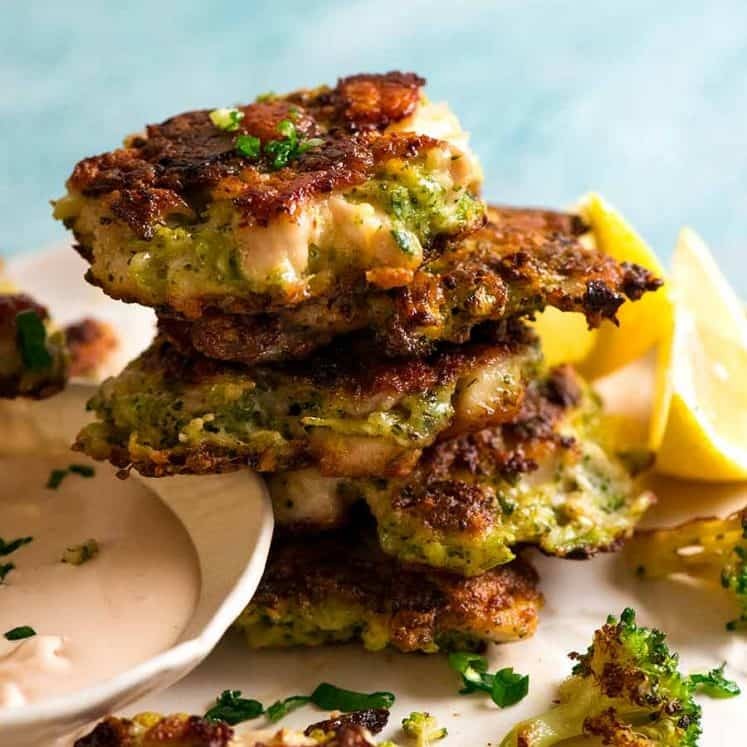 For this recipe, I add parmesan cheese to the breadcrumbs for flavour and as the seasoning – no need to add any salt! 3. 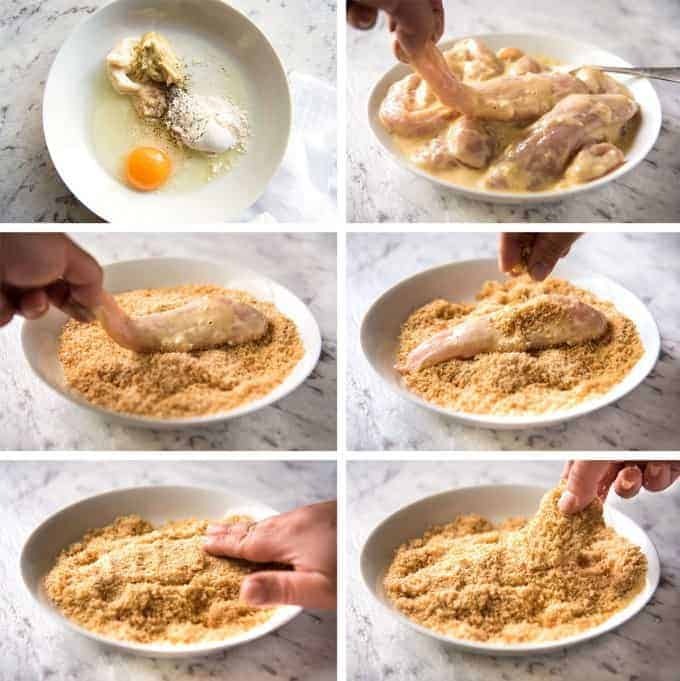 Avoid messy fingers: Mix chicken in batter, pick it up with your left hand and place it in the breadcrumbs. Use your right hand to sprinkle with panko, press to adhere, then transfer to baking tray. No Marshmallow Fingers! Yay! Here’s an up close and personal look at these tenders. 🙂 I’ll let you be the judge – don’t you think they look like they’ve just come out of the deep fryer??? They certainly TASTE like they have! 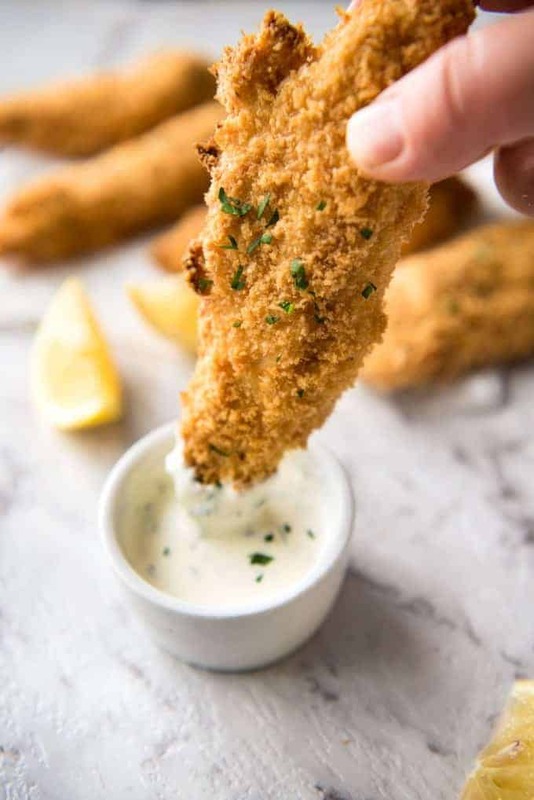 I like to serve these Parmesan Oven Fried Chicken Tenders with a simple Ranch dipping sauce or Honey Mustard sauce, both of which I’ve provided in the recipe notes. But honestly, with the addition of parmesan, these are super flavourful plus nice and juicy inside (no dry overcooked chicken!!! ), so I usually serve these without any sauce, with plain yogurt or sour cream, or lemon wedges. These oven fried chicken tenders TRULY come out just like they've been fried! They are a beautiful golden brown all over and super crunchy. Make these with chicken tenderloins or cut chicken breast into tenderloin length strips! 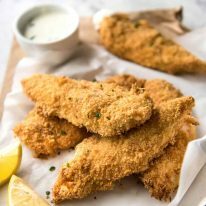 This is the parmesan flavoured version of these Truly Golden Crunchy Baked Chicken Tenders I shared last year. Spread panko breadcrumbs on a baking tray. Spray lightly with oil. Bake for 3 to 5 minutes or until LIGHT golden. Scrape into a bowl. Add parmesan and mix. 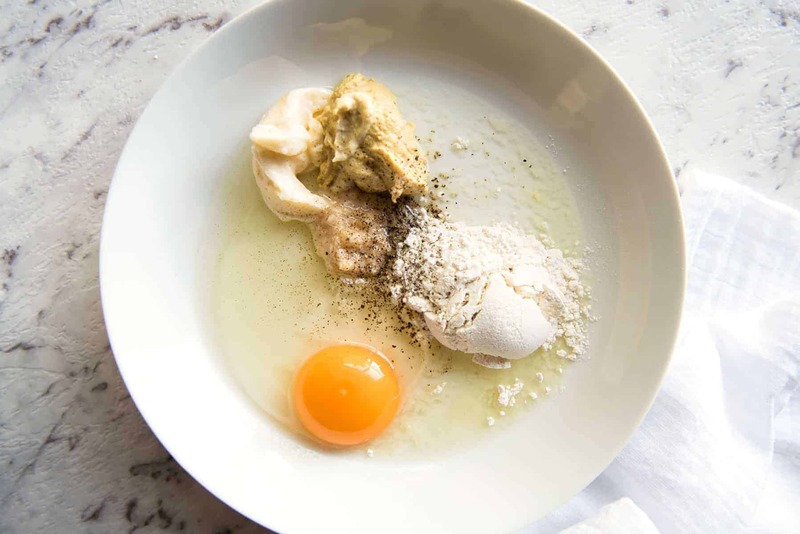 In a separate bowl, whisk together Batter ingredients with a fork. Add chicken and mix to coat. Pick up chicken with left hand and place in breadcrumbs. Use right hand to sprinkle with breadcrumbs, press to adhere. Use right hand to transfer to baking tray. Repeat with remaining chicken. Spray lightly with oil. 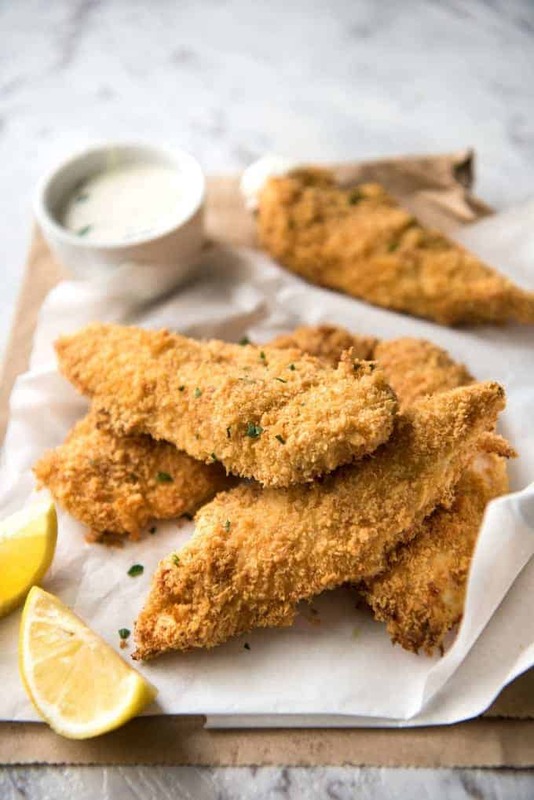 Bake for 15 minutes for small tenders, 18 minutes for large ones. No longer than 20 minutes, otherwise they will begin to lose juiciness. Serve immediately with Ranch or Honey Mustard Dip if desired (Note 4). 1. I really encourage you to use panko breadcrumbs rather than ordinary breadcrumbs because they bake much crunchier! 2. 1/2 cup store bought grated parmesan cheese (the real stuff in the refrigerator section NOT the pasta aisle!) = approximately 3/4 cup freshly grated parmesan cheese. This is still really tasty even without parmesan cheese, just use an extra 1/2 cup of panko and add a bit of extra salt into the batter. 3. The tenders come out more evenly golden if baked on a rack. This is optional though, if you place it directly on the tray then the underside will get some darker golden patches. Place ingredients in a bowl and whisk to combine. Adjust seasoning with salt and pepper to taste. a) All the herbs can be substituted with fresh herbs, finely chopped. Double the quantity - i.e. use ½ tsp. Don't worry if you don't have all the herbs. If you have at least 1, it will still taste similar to what it should taste like, just use more of the herbs you have (3/4 tsp dried herbs in total). b) The garlic powder is a key flavour component, fresh garlic is not quite the same. If you want to substitute with fresh garlic, use 1 small clove, mince it then make sure you set the sauce aside for at least 20 minutes to allow the flavours to develop. HONEY MUSTARD SAUCE: Another simple sauce I often serve this with - mix together 1/3 cup mayonnaise, 2 tbsp dijon mustard, 2 tbsp honey, 1 - 2 tsp lemon juice, salt and pepper. * These ingredients are optional. 5. 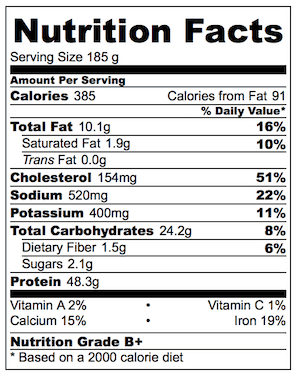 Nutrition per serving, assuming 4 servings (no ranch dip). 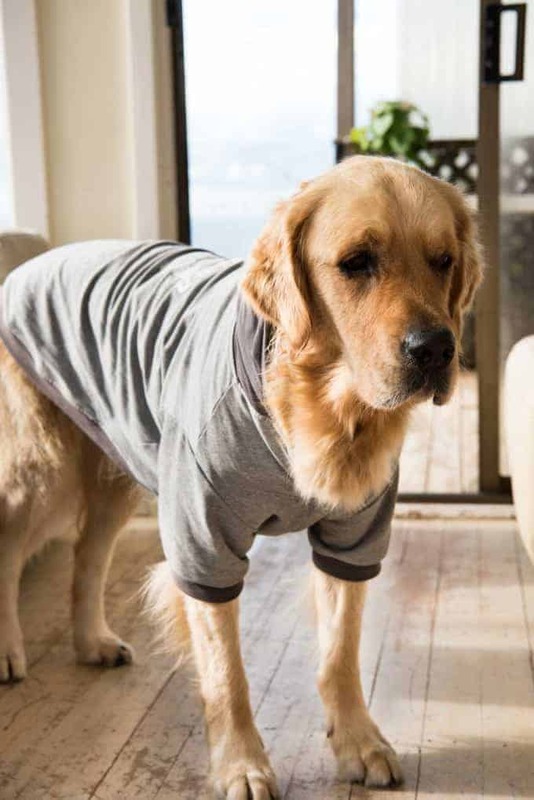 So embarrassed in this jumper, he can’t even look at the camera. 😉 It’s so cruel that I dress him up just for my own amusement!!! 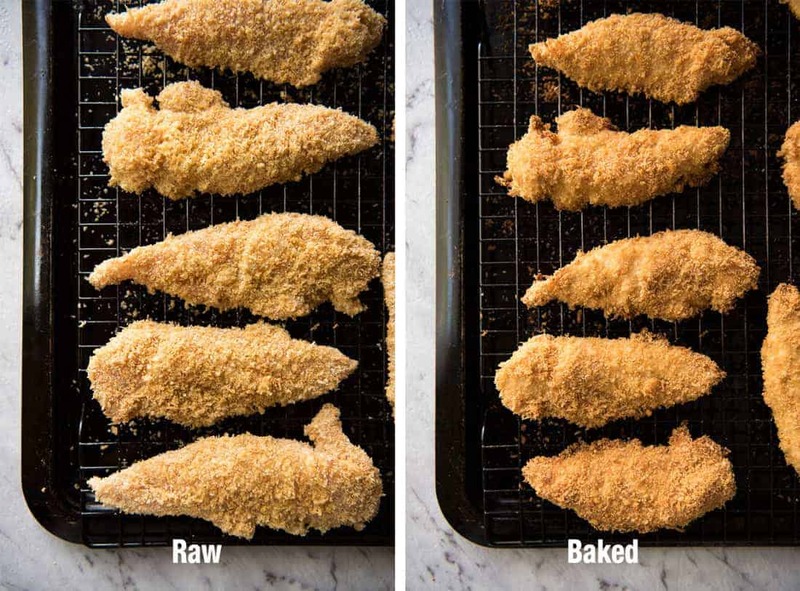 You might want to clarify that you can keep the toasted panko crumbs for another time but not if you have dipped the raw chicken in it. 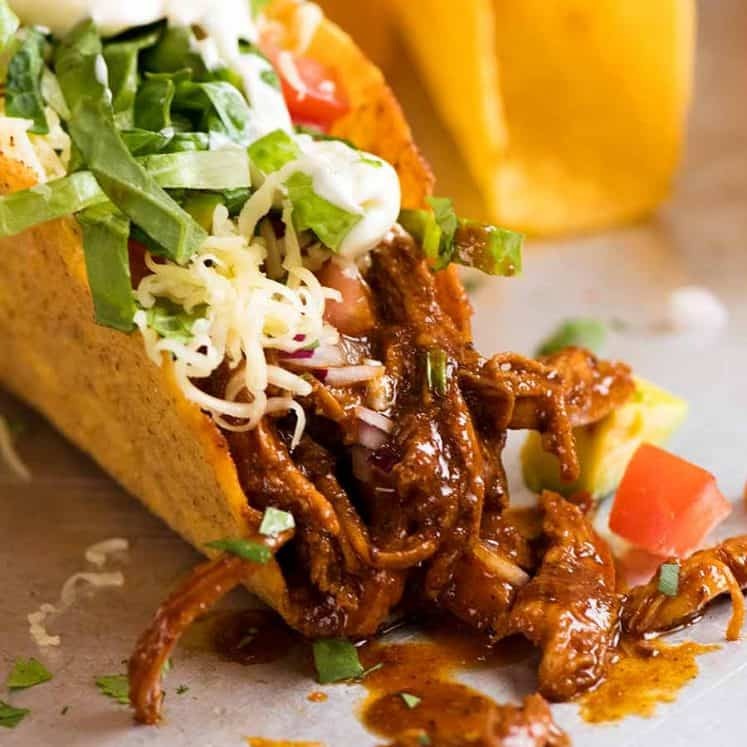 Tender, tasty, easy to make; what more could anyone ask for. You only need half the amount of panko crumbs. I think this recipe is an ad for panko crumbs and wants you to use more. Instead of baking them right away can we just freeze them and then bake when needed? 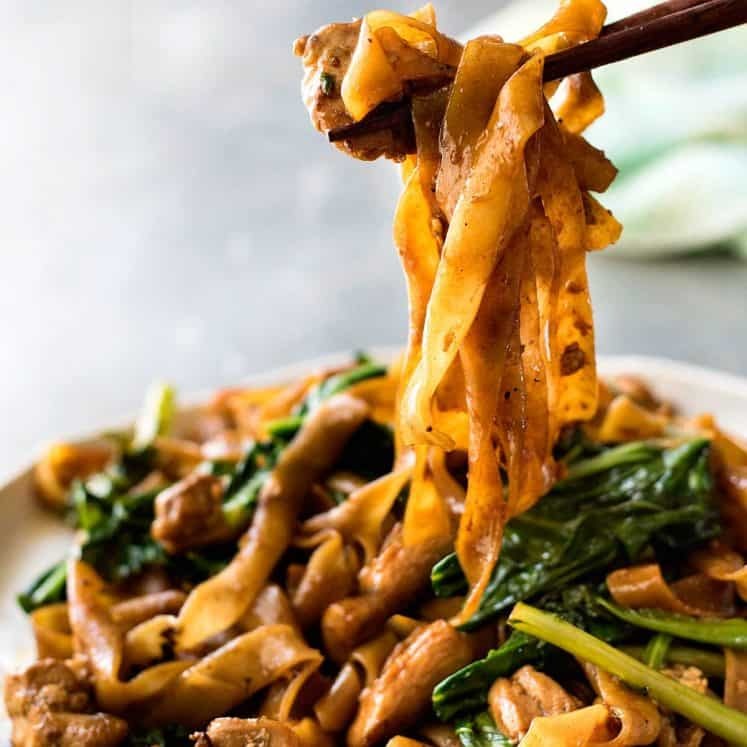 Hi Nagi — I’ve made 10+ of your recipes so far and just wanted to say thank you so much for sharing these. Am seriously loving this new innovative (and super effective) technique of dredging. You’re awesome! Made these today and my family just loved them.. I dint have mustard on hand so i just skipped it.. Still turned out to be delicious… And ofcourse healthy substitute !! Thanks for the recipe. Just made these tonight. My daughter and husband are both picky eaters. They both loved them and wanted seconds. Wow! This is a keeper recipe and I will be making these over and over again. I loved you no mess method. Just tried these. My husband and daughter are both very picky eaters and both loved them. I will be making these again and again. They were really easy. And I loved you no mess method. So much easier. I found you a year ago and ended up making the best Chicken Wings of my life! Fast forward to today, and my hunt for a Chicken Tenders recipe led me back to you! Definitely checking out the rest of what you have to offer! Thank you so much! 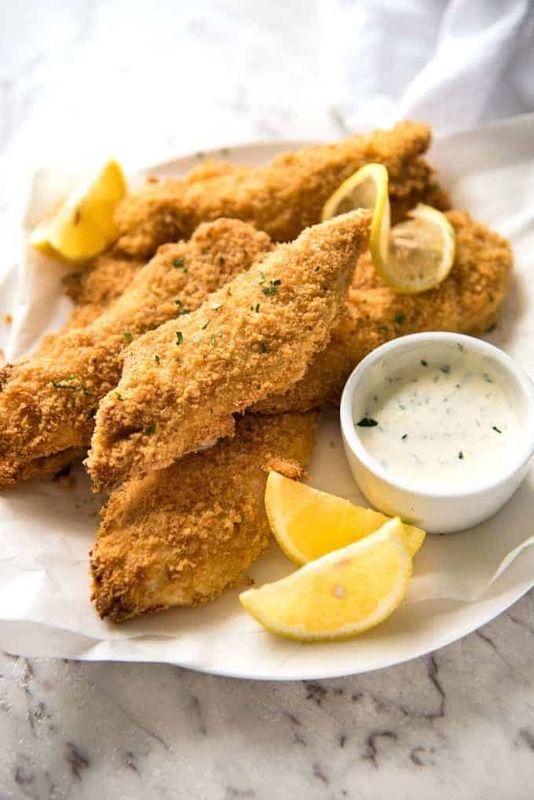 This is the best baked chicken tenders recipe I’ve ever tried. Thank you. I’ll never cook them any other way. A rack is essential. Also, let the tenders sit on the rack for a few minutes after taking them out of the oven. If you plate the immediately the bottom will get a bit soggy. Kids don’t like mustard. Any substitute? These look great! If I make a large batch, do you think they’ll freeze well after being cooked? Just discovered your site! Made these this weekend, except instead of mustard, I used Frank’s buffalo hot sauce in the batter, and I added red chili flakes to my panko because my family loves spicy! I cooked them in the actifryer for 16-18 mins, and they were so crunchy, golden, and the breading all stayed on! Teenagers and hubs approved! Thanks for the techniques! I was all ready to make these tonight, and then realized I didn’t have any eggs. So, used 2 Tbs. of mayo, thinned out to batter consistency with a little milk, and they were delicious! Love your suggestions to pre-brown the crumbs, and to combine the flour into the batter! Also, your method of eliminating sticky, gloppy fingers! Thanks so much!